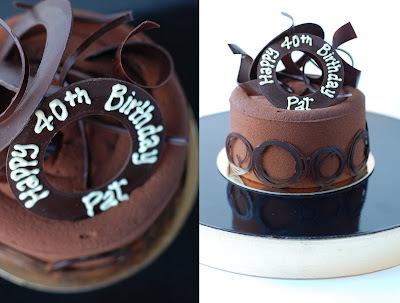 I was flattered this week to be referred to make a birthday cake by someone who I was lucky enough to work with during my most formative months as a very green pastry cook, during a time when my metamorphosis from medicine to pastry was still raw and disorienting. 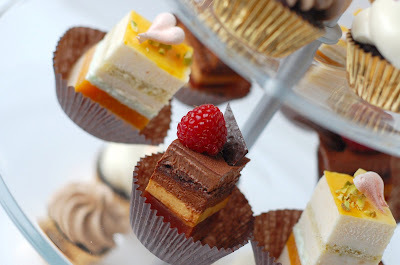 Undoubtedly, cake requests are always flattering but if the recommendation comes from someone equally or more qualified than me, the compliment is that much sweeter. Thanks Fionna. 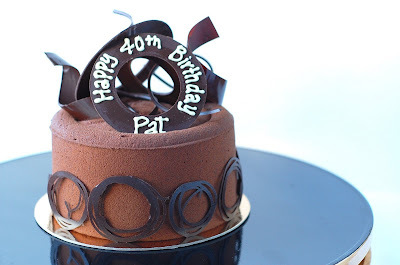 This cake would satisfy any chocolate lover and is most elegant in its simplicity. 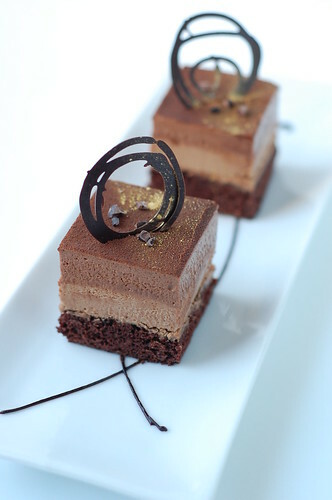 I was asked to combine milk and dark chocolate in glorious mousse form and naturally, with rich chocolate cake. For some crunch, a sprinkle of cocoa nibs intermingled between the layers. My current design motif involves rings; I have recently been surrounding myself with annular patterns, in jewelry, a Pylones thermos, and now in chocolate. Perhaps, I'm tired of corners? 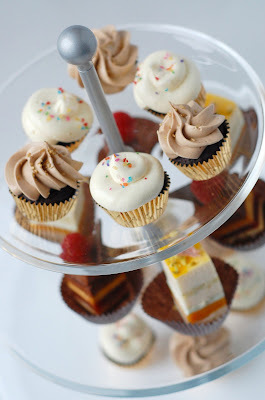 Some leftover mousse and cake allowed me to throw together a few individual portions to enjoy and photograph. Call it quality control or maybe show and tell, since with cake requests, I can never photograph a cake's interior and show it to you folks! The traditional colour central to all Chinese weddings is red. From the invitation, to tablecloths, to the bride's dress, everything is red, representing love and happiness. Equally important in Chinese culture is prosperity which is represented by gold. Put red and gold together you have the obligatory Chinese wedding colour scheme. Personally, I do not think I have ever owned a red dress (I'm shy) and instead wore a ivory and gold cheong sam during my wedding reception. 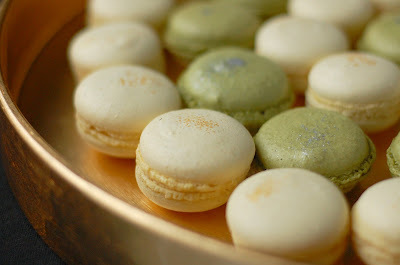 For the unconventional Chinese bride who loves French pastry and citrus, lemon macarons with lemon curd and a sprinkle of edible gold dust were perfect. Although I have seen red macarons before in Paris which would have looked spectacular with a splash of gold dust, an unpleasant amount of artificial colouring is required to achieve an intense red that does not appear pink. As you may guess, I am not a big fan of red velvet cake either (sorry!). 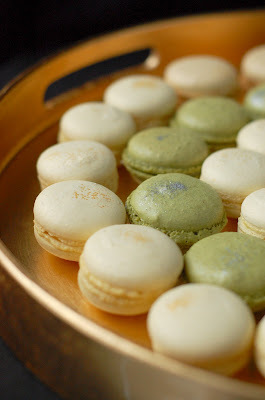 As a nice pairing to the lemon macarons, there were also green tea macarons with white chocolate coconut ganache filling which received a light silver lustre. The flavours were very complementary and appealed to the Asian palate. 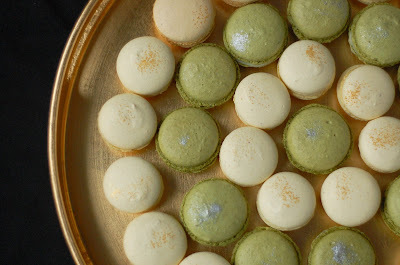 Matcha powder is becoming easier to find in stores these days and gives a lovely earthy green hue to the final product; however, it does have a strong flavour which can be overpowering and if you use too much like I did in a pastry cream once, you end up with something that resembles algae! My husband and I celebrated our fifth wedding anniversary last week and despite the record snowfall in Vancouver, we had a superb time. In fact, five years earlier, our wedding day was preceded by snowfall which gave the perfect backdrop to our ceremony, cold and crisp but clear with freshly dusted North shore mountains glowing at sunset. Oh I'm gushing. This year's gift, in accordance with the traditional anniversary gift list, is wood, seemingly not the most romantic of substances, but nonetheless worthy of giving in some form to the one you love. The Scrabble Premier Wood Edition game was the obvious choice for him, especially appropriate for wintery house-bound evenings. So far, we are tied at one game each and I am expanding my vocabulary with legitimate 2-letter words. 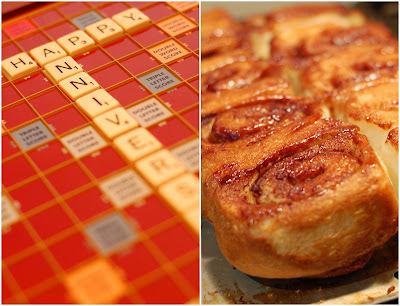 After some brainstorming, my secondary gift which had to be wood-related but edible was the cinnamon bun. True cinnamon is the bark from the Cinnamomum zeylanicum tree, although, what North Americans call cinnamon is more likely a related species, Cinnamomum aromaticum, which is also called cassia, a more intensely flavoured and woodier bark. As seasoned alumni of the University of British Columbia, Eric and I both have a soft spot for those legendary UBC cinnamon buns and several years ago, I found the official recipe (I use butter instead of margarine). These buns are not as gooey and smothered in icing as typical cinnamon buns; instead, they have a lovely caramelized crust and soft interior. As a freshman, I may have consumed one per day before my waistline begged me not to. Happy Anniversary!